It's $13.50 for admission to Omaha's Henry Doorly Zoo, where, in the Butterfly and Insect Pavilion, I can immerse myself in a conservatory with miniature waterfalls and an Amazon water lily pad pool. Ten-foot-high glass sidewalls let sunshine pour in; so much sunshine, in fact, that sunglasses are necessary. Hummingbirds will buzz past me, fluttering from one over-sized flower to the next. Butterflies attach themselves to my ankles, my clothes. Their wings tickle, lick my skin and cheeks. It's $13.50 to walk on a constructed promenade. It's free to walk through my backyard. In the sixteen years we have lived in this house, there has not been a summer we have been without milkweed. 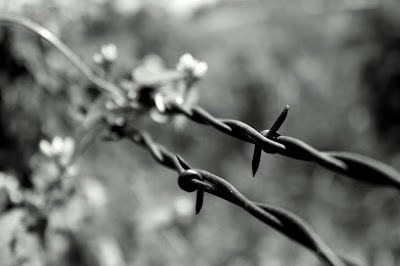 It grows, clumpy and cascading, across the stretch of barbed wire that divides our property from the edge of town--an alternating field of crops. Curtains of leaves and pods alike blanket the fence, intertwined with the barbs. 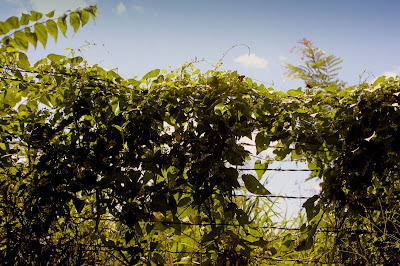 Vines weave in and out and up and down the fence, curving and stretching towards sticks, volunteer trees and overgrown thistles. The leaves sprout and fan over the white clusters of flowers. 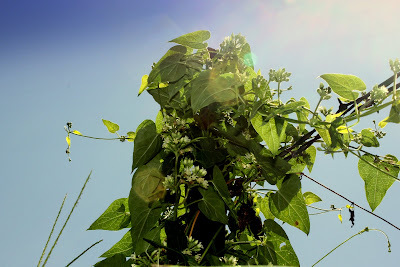 Ripe and blooming, the flowers burst across the pods, still green and puss-like. The plants are so green and fresh; pods that will one day split and burst are indistinguishable on the barbed-wire lattice. Butterflies are nestled amongst the leaves. 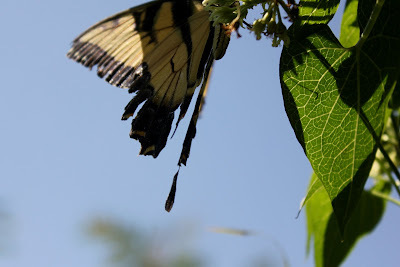 Some flutter, while others solemnly sit, cautiously flapping their wings open and shut, open and shut. Their enemies, warriors, hum past them, wings beating furiously. As I ease my camera within millimeters of the creature, I hear and feel a stinging drone buzz near the corner of my eye. I take a step backwards, then another. My gaze gently floats, focusing on and following a monarch whose mate already feasts upon the milkweed, its sole food source. The weather is welcomed. After having suffered weeks of triple digits, the gauges topped off in the mid-80s, a relief to the weeks in which we were all met with a wall of heat. The sad, melancholy wind was cool, not thick and heavy like the sticky humidity that coats our skin. A blue jay croons nearby, eyeing me and the insects he more than likely wished to devour--wishing to consume one of those beautifully delicate, intricately decorated winged creatures. So many of them cluster together, feeding and pollinating the same white flower. 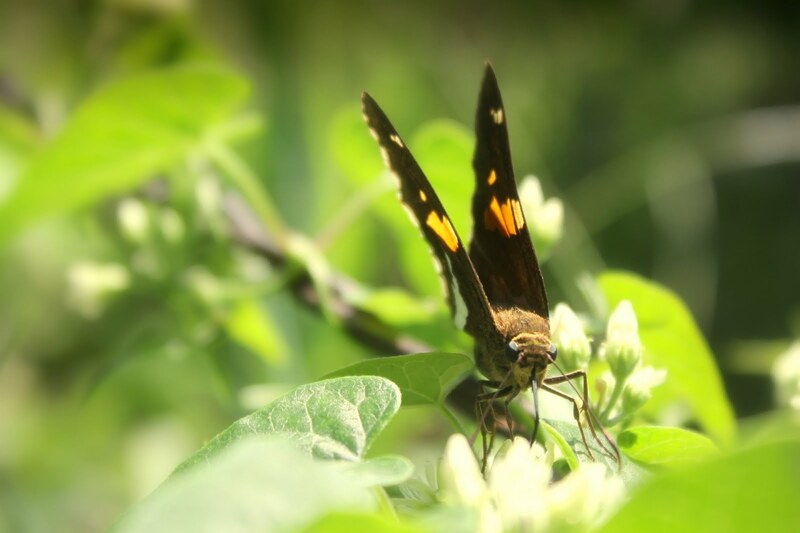 Whether I stand or squat, squint or gracefully eye each flight, the wings of butterflies brush past me. I hear the flitter and flutter in my ear, feel their tickle in my hair. They erupt in a cloud of wings and flapping if I approach them too quickly, but if I gently and cautiously nestle amongst the milkweed, bury my lens within the vines and patiently sit, they soar and glide, rest upon me and my camera. If only I could capture one flying. If only my reflexes were fast enough. If only I could capture the magic of one flight; one fragile, soaring monarch or swallowtail. 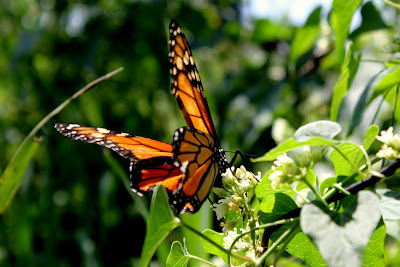 It would be magic; it would remind me of summer, of the milkweed that grew on the backyard fence. I sit for awhile in the hammock, rocking back and forth and watching the trees above my head. Their branches duel, and the breeze waves the tiny leaves east, then west. My winged company glides slowly over to me, gracefully doing laps between the field and where I rest. 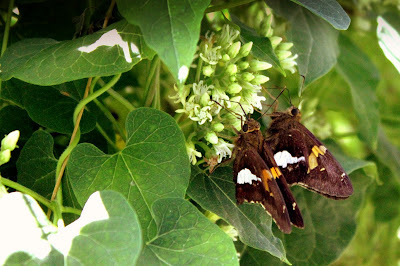 The Midwest wind carries them over the fence, out to the trees, above the soybeans. They stop, frozen in time and space and motion over a row of plants. 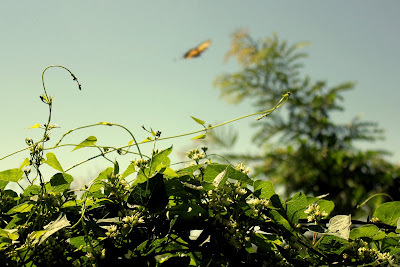 Wasps and hornets and bees flank the butterflies, arguing for territory and threatening me with wings and stings. 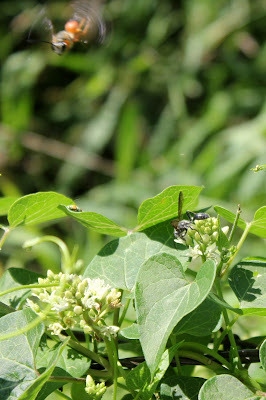 The milkweed, quite literally, hums with activity, and I see one small wasp ride the back of another. 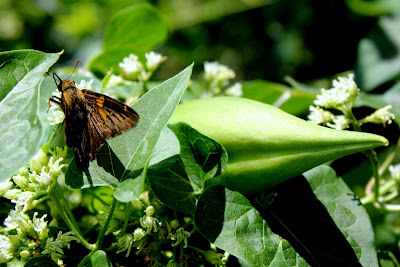 They fight, tumbling down one leaf and the next, scaring and scattering other creatures. 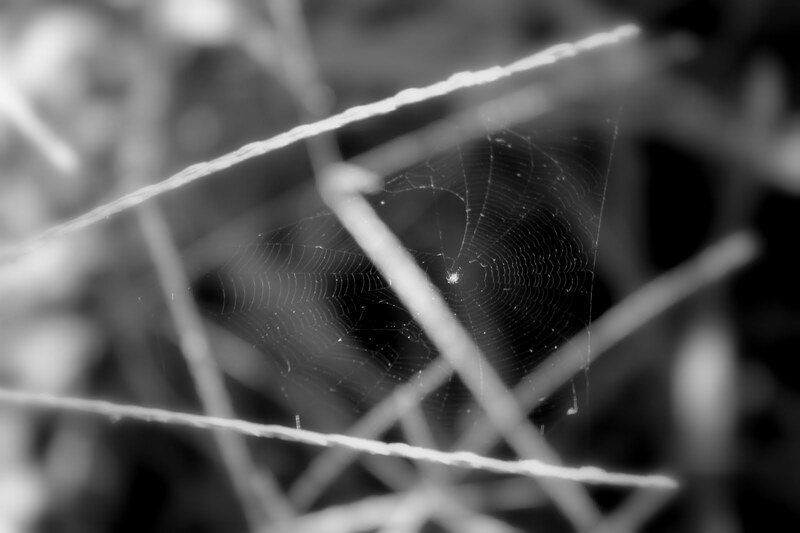 A tiny web, an intricate knit of silk, bobs between two blades of grass. I photograph it, innocently, admiring the spider's household. I feel monstrously guilty when, by accident, I pinch the blades together and destroy the web's octagonal strings. "I'm so sorry," I whisper to the spider, who has fallen, buried and hidden, into the grass below. It's too precious. Each insect, created ... and I disrespect them. I invade their buffet, destroy their homes. 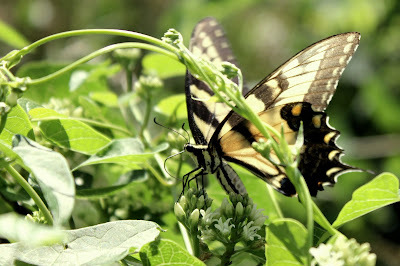 It is just as heartbreaking when I spot the swallowtail again, whose wings are battered and shredded. in sticky drops of summer. It's all beautiful; it's all home. For sixteen years, we've lived in this household. 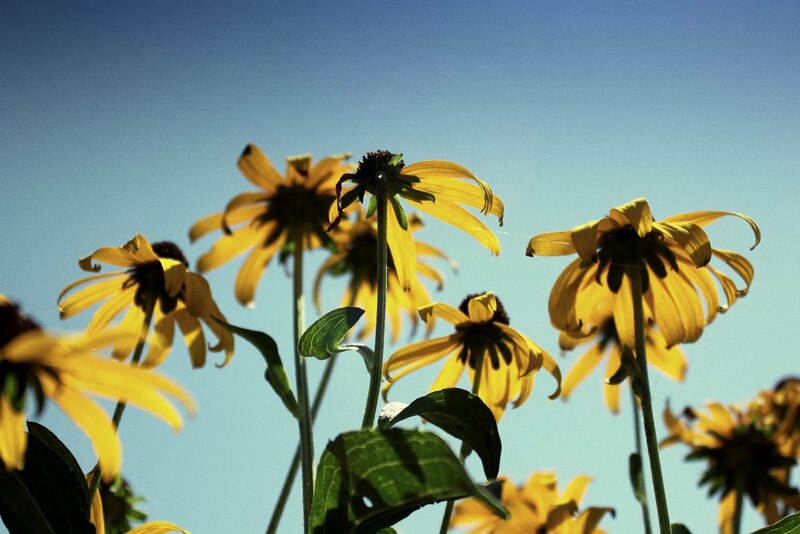 We may not have waterfalls or promenades or flora from the Amazon, but it is free, and there is sunshine. So much sunshine that sweat will bead and trickle down to the small of my back. So much sunshine that each dull color of my backyard seems brighter, saturated, more heavenly. There are still flowers, but they grow in small, white clusters that butterflies and wasps and bees and birds feast upon and devour and pollinate and harvest amid intruders like myself, intruders whom they still welcome with winged tickles. For sixteen years, we've never been without milkweed. For sixteen years, there has always been beauty. 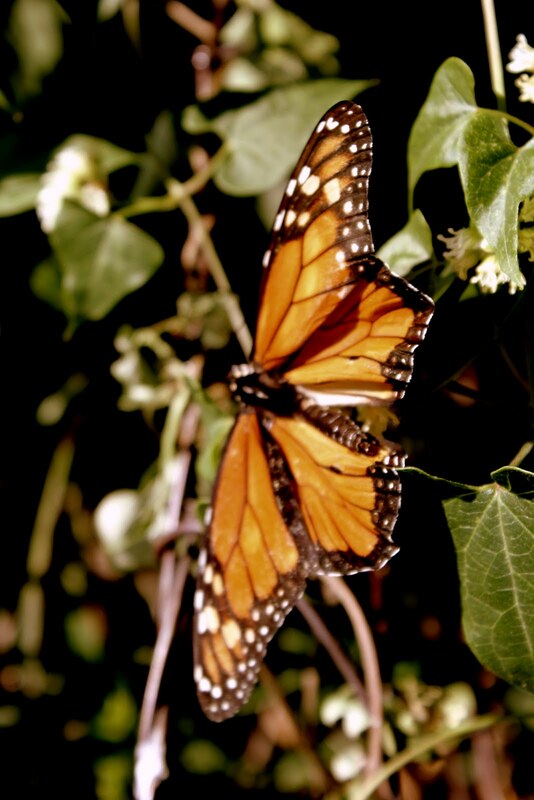 Fluttering, flying, soaring, delicate beauty. In my opinion, those butterflies added beauty to the flowers.